Historical Medora North Dakota is home to five National Register of Historic Sites, all easily within walking distance of each other. 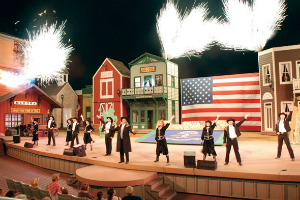 Not to mention the rootin' tootin' Medora Musical which features music, dance and even live horses in the spectacular open air amphitheater. And before that you get to enjoy Pitchfork Fondue, seriously, meat fondued "western style" on a pitchfork. Now that sounds like a vacation! This escorted tour includes motorcoach travel, luggage handling,1 night accommodations, 1 breakfast and 1 dinner.